Beautiful! Your food looks so yummy, I wish I could try it. Also wish I could get those jelly balls. Haven't seen them here in the USA. Such a sweet, ultra cute kitten! It is so cool that your kids picked out what they wanted in their bento. 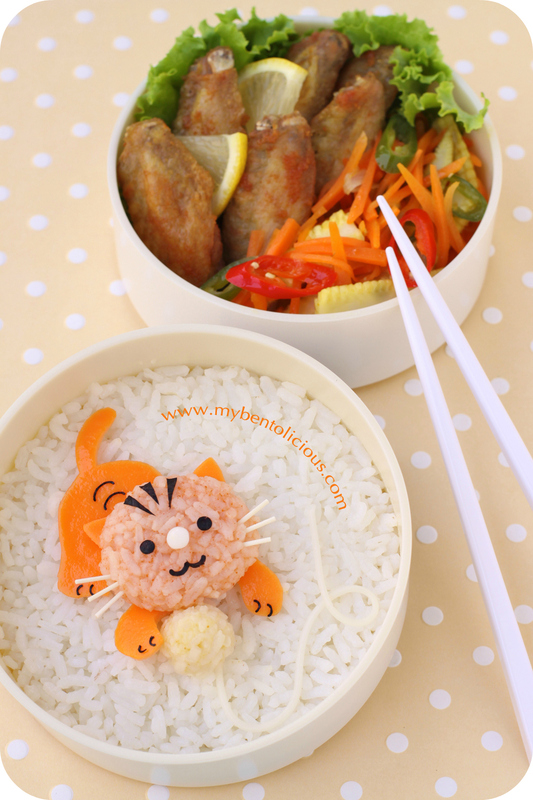 Have a restful weekend and charge up for more bento making! The little kitty is super cute...! I love how you combine rice and eggsheet to make the cat, very creative :)!! So cute! You know - I kind of forgot that I could use furikake'd rice for most of my characters. Aside from onigiri based ones of course. ^^ I love all of it! @Natakiya : Thanks a lot Natakiya! Sometimes I run out the idea to cook for kids' bento. Easier way is to ask them hehehe ... :D Hope you enjoy your weekend too! @Journal Mommy Yenny : Thanks a bunch Yen! Delightful kitty, I love this so much, Lia! Delicate and soooo cute ^^! It looks so simple but when I read about what it was made from, so much details! Love this little tiger..
@ChantaleP : This kitty / little tiger is really easy to make, believe me. Thanks a lot Chantale!